How fun is it that we bloggers get to meet friends all over the world, all nationalities, all ages and through the scrappy world, we can come together to celebrate life's great occasions?? Today is one such FUN occasion -- Tina at Crafty and Green is turning 30! And she's hosting a blog hop to help celebrate the occasion. So if you've come from one of my BFFs, Susan's blog, you're at the right party. 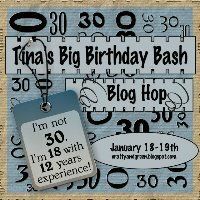 Be sure to stop and wish a happy b'day to Tina at her blog, too... as she says, she's not 30, she's 18 with 12 years of experience! I made this tri-fold card for Tina, which features an adorable digi-image of a housework fairy by Mo Manning at Mo's Digital Pencil. I paper-pieced the fairy's dress and apron using the reverse side of some Nikki Sivils Scrapbooker paper, in the My Li'l Monster line. Snips of the same paper decorate the center of the folded card. The cover I designed, typeset and printed on my computer. Ellen - http://cardmonkey-business.blogspot.com/ YOU ARE HERE! Amanda http://craftsbyamanda.blogspot.com/ Please visit here next! Stunning Card,Ellen!! It's perfect!! Hehe! Thank you so much for joining in on this hop to celebrate my 30th Birthday!! So Happy to have such a talented & crafty friend!! Girl! This is so WONDERFUL! I so love your creativity...always so original. I love the idea of this card! Your cards are always a work of heart!!! Love the fairy! Can't wait for my birthday if I get one of those (he he)! Glad to be hopping with you again!! Cool card the the saying. Thanks for sharing. This card is just too stinkin cute. I love the humor in it! I love this card especially the housework fairy. Beautiful! I love tri fold cards!!! Wow you are so talented girl! I like all the sentiments on the card. Awesome card! Love that housework fairy...lol... I need one of those for real...lol. It's been fun being in the hop with you! This is a great card. I really like the Tri-Fold! Love the tri-fold card! Very cute!